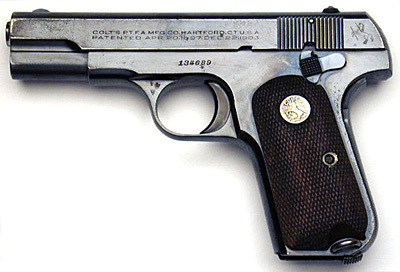 Colt Model 1908 .380 ACP serial number 134689. 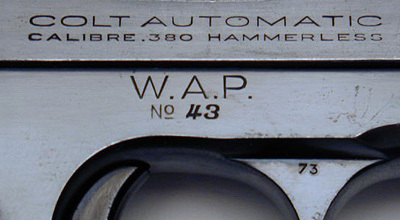 One of approximately 200 pistols in the 134000 serial number range inscribed on the right side of the frame "W.A.P." over "No 43". This pistol was shipped in a 100 gun shipment on January 14, 1942 to the British Purchasing Commission, 15 Broad Street, New York, NY. These pistols were presumably ordered for the Western Australia Police but the order was cancelled and the pistols were redirected to the British Purchasing Commission in January 1942. 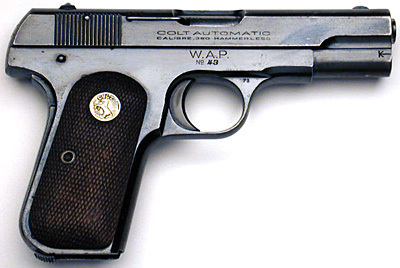 Unlike the SMP marked Colt Model M .380 pistols, this W.A.P. example retains the original blue and original grips The magazine safety disconnector is still functional. Left side of W.A.P. 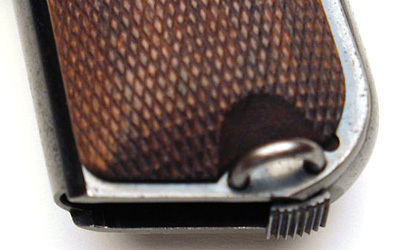 Model M .380 ACP showing factory lanyard loop and hole above thumb safety for the thumb safety retaining screw. 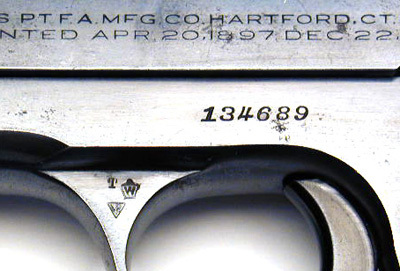 This pistol bears a "W" in a Crown stamped on the upper left flat of the trigger guard. Close-up of factory lanyard loop.